It’s Tuesday morning in Ilocos Norte. We are on our way to Paoay. Internationally famous for the St. Augustine Church, a World Heritage Site, Paoay is more popular with locals for its bi-weekly market: a gathering place for farmers, craftsmen, weavers, and fishermen to sell their produce and wares to an eager buying public. Every Tuesday and Saturday, buyers and sellers come together in a frenzied exchange of commerce. As we enter the market, A and I part ways. 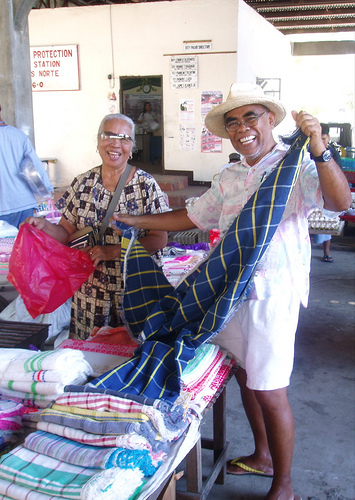 She goes off with our Sitio Remedios host to buy tablecloths, napkins and blankets while I set my sights on the fresh produce on sale. Time to pull out the camera and explore. What seems like little white pebbles neatly arranged on heart-shaped leaves are actually ant eggs called abous. 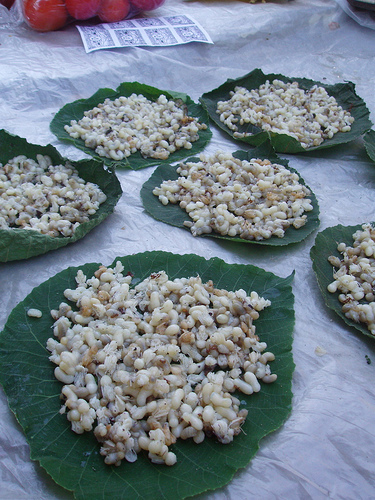 This rare Ilocano delicacy is collected by farmers using the technique employed by bee keepers. By smoking out the ant colony, the ants become more docile and less likely to attack. While the ants are in this trance-like state, the farmers are carefully able to collect this precious, little pearls of jungle caviar. 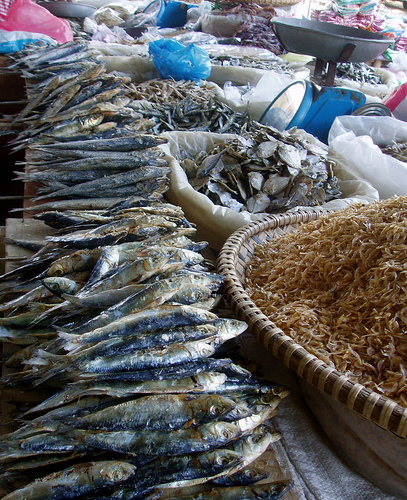 Ilocos is blessed with an abundance of seafood. But since refrigeration is not always available, other means of preservation are necessary. Salting and drying are usually the methods of choice. From small, whole shrimps called Kurus to larger fish like Cabballes, once caught, they are cleaned, salted and laid out to dry in the hot Ilocos sun. In the early mornings along the beaches of Currimao, shallow bancas would congregate just off-shore. During the morning’s low tide, fisher folk are able to reach down and harvest the rich array of seaweed growing on the sea floor. 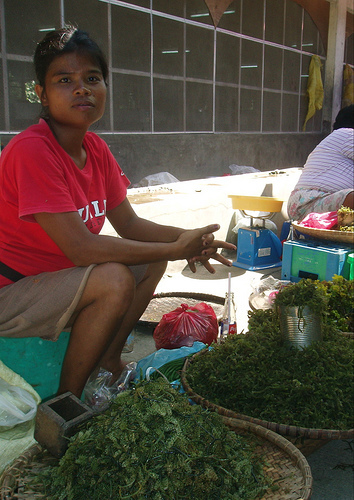 I’ve eaten my fair share of seaweed but the variety available at Paoay market is simply astounding. From the more widely available, grape-like ar-arusip to the more native, twig-like pokpoklo, I’m fascinated by these emerald bounties of the sea. I feel just like a kid visiting an aquarium. I’m not a big fan of rice cakes. But here in Ilocos, to not have a taste in one form or another is nearly impossible. The sheer array of shapes, sizes, colors and wrappings overwhelm my sense of curiosity that I find myself trying every glutinous concoction presented to me. 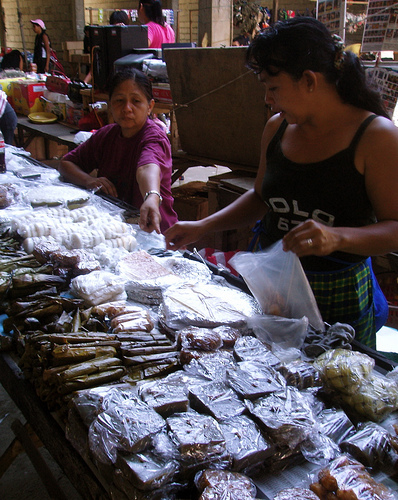 On offer at the market weren’t only the more popularly known rice treats like kutsinta and puto but also more indigenous creations: like the impaltao, a pillow-like purse filled with glutinous rice, wrapped in stripes of banana leaf and boiled in a syrup of sugarcane or the linapet, a triangular shaped delicacy of glutinous rice sweetened with molasses and coconut oil. Leave it A. to find the local fashion industry–or at least locally-made raw materials. Abel Iloko are hand-loomed cloths, proudly made in the Ilocos provinces. Used as tablecloths, napkins, blankets, towels and even everday clothing, abel can be a bit stiff and rough at first. But over time and with proper care, the fabric softens, becoming light and airy to the touch. Some abel iloko are so intricately made that they are considered family heirlooms and are passed down from one generation to the next. What did I bring back in my shopping bayong? Needless to say, a heavy pile of tablecloths, napkins and towels care of A, a couple of large, dark clay cooking pots for my mom’s kitchen and a camera full of captivating memories to share. Once again, thank you to Rene Guatlao, the font of Ilocadia knowledge. Hi Katrina and Mila. To answer your question...Yes, I did try the eggs. Our host bought all of the abous available and had their cook make it into an adobo. Honestly, it was a bit forgettable. Salty, Smooth to the bite and then, squishy in the middle. I think the abodo marinade was too much for the delicate eggs. Franco, then you might also be interested in a Quezon delicacy, bee larvae. My boyfriend once tried it, said it was a popular snack there. He said it was sweet from the honey (and sometimes condensed milk), but the wriggling sensation on the tongue was off-putting, to say the least! Hi rasa malaysia. Hahaha. Actually,I think the technical term is larvae, not eggs. But, I heard the ants are fairly big and painful biters. Hi Katrina. I'm there. :) Next road trip. Where in Quezon exactly?